some Vehicles may include a standard limited warranty from the manufacturer. This will be indicated on the product listing. A Qualified Mechanic must perform final assembly, initial setup, adjustments and oil service at his/her own expense (even on assembled units). Labor is not covered under any circumstance and no credit will be issued. A copy of the mechanic’s assembly invoice is required for any warranty coverage. Missing or broken items noted at Delivery Time will be replaced free of charge under Manufacturer Warranty. Customer must inform us within 48 Hours of delivery by completing a Help Request on our website. Customers can purchase EXTENDED WARRANTY COVERAGE. If a Warranty is offered on your Vehicle, you will see Options to add Extended Warranty Coverage on the product listing. Manufacturer Warranties cover defective parts only and do not include parts worn by standard use (such as tires, belts, clutches, batteries, lights, chains, etc.) or parts damaged from use, accidents, abuse, misuse or improper setup and maintenance of the product. LABOR IS NOT COVERED FOR ANY REASON. Customer must send defective parts in for inspection prior to a replacement being sent. Customer is responsible for shipping charges until part is deemed defective. Parts returned will be inspected and if deemed defective, will be repaired or replaced at Manufacturer's option. Customer shall be responsible for shipping charges to the Manufacturer. Shipping expenses will be reimbursed if the part is deemed to be defective by the manufacturer. Parts deemed not defective or not covered under warranty shall be discarded or shipped back to the customer upon payment of shipping fee by customer. customer can purchase a part at any time. This factory limited warranty agreement is provided by the manufacturer of your product. There are no agreements or warranties, expressed or implied, including warranties of merchantability or fitness for a particular purpose, other than those stated in this agreement. 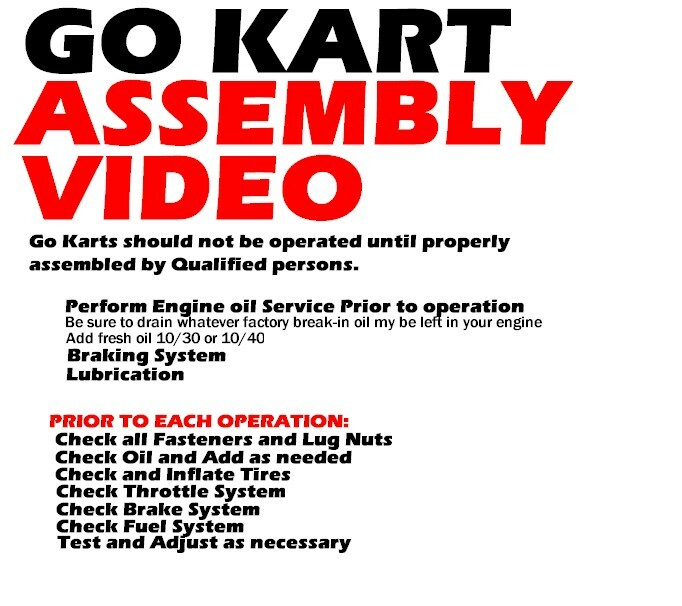 Customer agrees to enter into this agreement by purchasing from GoKarts USA. The below warranty periods begin on the date that the unit is delivered or picked up. During the warranty period, depending on the model, your warranty will cover parts only and the cost to ship parts. 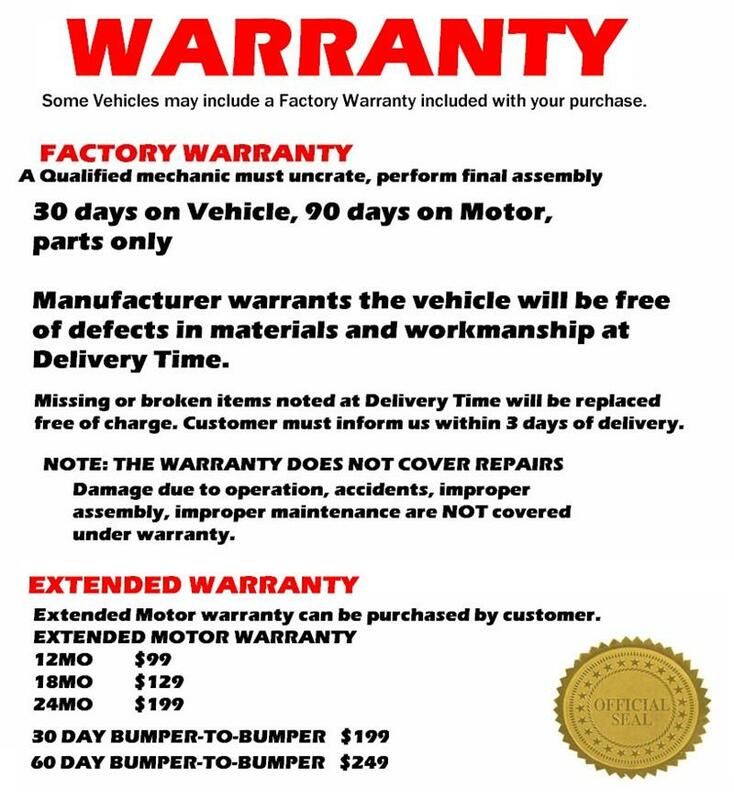 This warranty does not cover labor or shipping to send back defective parts. If a part is deemed to be defective by the manufacturer, the customer will be reimbursed for shipping. • Parts are covered under this warranty to be free from manufacturer defects. Parts not included in this warranty are listed below in the Warranty Limitations. Any parts deemed questionable by the manufacturer must be submitted for inspection and approval. • A qualified mechanic must perform the initial vehicle set- up and routine maintenance to maintain full warranty coverage. Failure to provide a mechanic’s invoice will void your warranty. Complete a Help/Warranty Request on our website. • Include as much information as possible so we may help you to the best of our ability. • List the part(s) that you need. If you do not know the part(s) you need, one of our advisors will assist you. 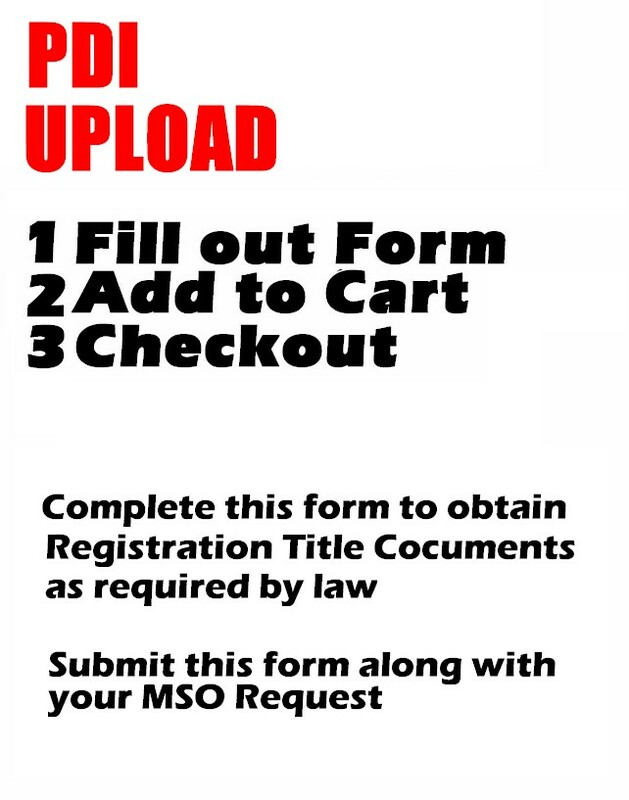 • Follow all checkout steps until you reach the Confirmation page. Please note; photos may take a few moments to upload to your request. To avoid loading issues, only click “ADD TO CART” once. The webpage will notify you once the request has been added to your shopping cart. All defective parts must be returned if asked for at the customer’s expense. This cost will be reimbursed to the customer if the part is determined to be defective. A warranty claim will be denied if defective parts are not returned when requested. The Customer is responsible for freight to return the product. If the product is determined to be defective, your warranty will cover parts, factory labor, and freight to send out replacement or repaired components. If the product is determined to be damaged, due to causes other than manufacturer defects, the customer is responsible for parts, factory labor, and freight to send back replacement or repaired product. 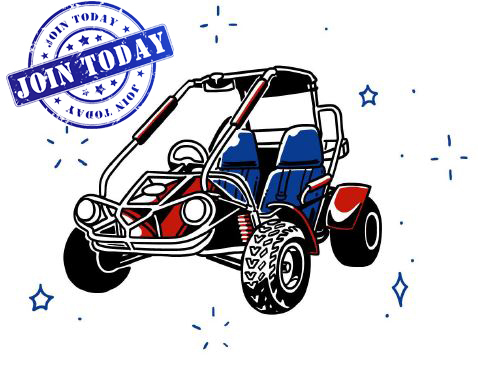 GoKarts USA is not responsible for shipping delays as it is at will of the shipping company or unpredictable circumstances. The Customer is responsible for any extra shipping cost that occurs after the part has been shipped. This cost includes, but is not limited; to change of address cost, change of zoning cost, re-weight cost, lift gate service. Warranty orders can be canceled before they are shipped. Once a warranty order is shipped, all payment related to such order is non-refundable.